You know them by many names – promo codes, discount codes, offer codes – but they all have one thing in common – they’re yesterday’s technology. They limit your marketing opportunities – and don’t meet the needs of today’s mobile consumers. CodeBroker mobile coupon software makes it easy for marketers to deliver sophisticated mobile coupon marketing promotions that get the mobile shoppers of today to open their wallets. Offer personalized coupons via any digital channel. 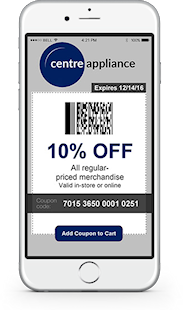 Deliver single-use and multi-use mobile coupons, on demand coupons, and SMS text coupons. Track and attribute redemptions for exceptional customer intelligence all at unprecedented scale. And CodeBroker mobile coupon software supports a crawl-walk-run approach — you can start small with simple coupon promotions, and expand easily into more sophisticated coupons over time — so you can move quickly, engage more shoppers, drive higher mobile coupon redemption rates, and deliver immediate results. CodeBroker mobile coupon software puts coupon redemption power at your fingertips, with mobile coupon redemption rates that consistently exceed industry norms. CodeBroker mobile coupon software has unique capabilities that get consumers of today to take action. The key is CodeBroker’s mobile-first approach that gives each customer the ability to acquire, store and redeem mobile coupons based on her preferred digital channel, to increase engagement and coupon redemption rates. CodeBroker mobile coupons can be delivered and redeemed via any digital channel – SMS, mobile app, mobile wallet, email, social — as well as the desktop. Flexible coupon models – single use, multi-use, on-demand coupons, and load-to-card – to address your specific business goals. Offer coupons for in-store and online use, and make your in-store coupons work online. CodeBroker mobile coupon software can also bridge disparate systems, such as e-commerce and POS, to ensure immediate coupon expiration across all channels. Offer on-demand SMS coupons for new and potential customers to drive immediate purchases, or deliver coupons to your existing marketing lists and customers. Easily employ a branded MyOffers wallet so customers can find and organize your digital coupons, offers, and rewards using their mobile and desktop devices. 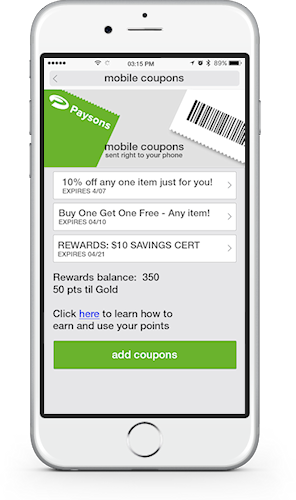 Deliver millions of SMS coupons daily (including single-use coupons), each with a unique bar code and/or other content offer to drive higher redemption. Mobile is quickly becoming the preferred method for consumers to use coupons. Learn what more than 1,200 consumers have to say in the 2018 Mobile Coupon Research Report. See CodeBroker Mobile Software in Action!